The 5G Infrastructure Association launched an activity in 2016 to first, generate a strategy for developing a Pan-European 5G Trials Roadmap, and then, second, to prepare the comprehensive Trials Roadmap. To generate these documents and roadmaps the 5G Infrastructure Association coordinates a 5G Trials Working Group expanding the work initiated by the Industry and EC in the context of respectively the 5G Manifesto of industry in Europe and the 5G Action Plan of the EU Commission. This group has to date produced 4 Versions of the Trials Roadmap. Nov. 2018: The 5G Pan-EU Trials Roadmap Version 4.0 has just been released. You can download this version of the Trials Roadmap here: 5G-PPP Trials Roadmap Version 4.0. The 5G Pan-European Trials Roadmap Version 4.0 has been elaborated and is supported by the Trials Working Group (WG) Members organizations. It is coordinated by the 5G Infrastructure Association (5G-IA), expanding the work initiated by the Industry and the European Commission (EC) in the context of the 5G Manifesto and of the 5G Action Plan (5GAP). 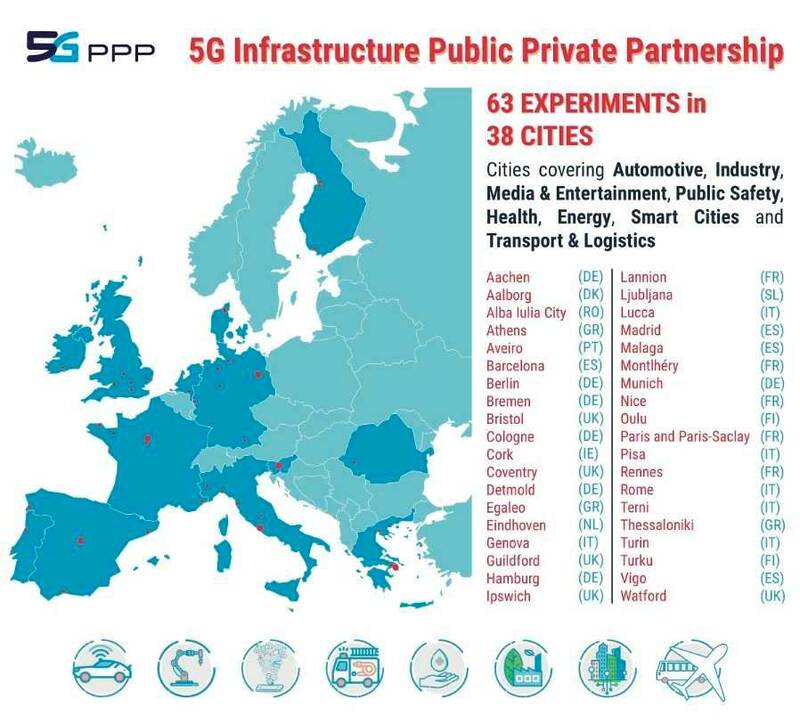 This Roadmap Version 4.0 highlights the key EU cities that are targeted for 5G early deployments, already engaged in 5G pre-commercial/commercial trials and pilots, engaged in 5G R&I trials and pilots and also making available 5G R&I platforms. A description of the major EU cities engaged in the 5G UEFA EURO 2020 Flagship event is also provided. The 5G-PPP Trials Roadmap Version 3.0 was presented and discussed at the 5th Global 5G event in Austin, USA on the 16-17 May 2018. The comprehensive Trials Roadmap document version 2.0 was released before the 4th 5G Global Event organized on 22-24.11.17 in Seoul. This document was made available ahead of MWC 2017, focusing on the Trials Roadmap strategy, with a view to informing the community of the approach being taken and to invite more contributions. The Trials Roadmap Strategy Document may be Downloaded here. The Trials Working Group was launched by 5G Infrastructure Association in September 2016 after the publication of the 5G Manifesto of industry in Europe and in the context of the 5G Action Plan of the EU Commission. According to the 5G Manifesto industry in Europe will develop by beginning of 2017 a European trial roadmap on technology trials and Pan-European trials with vertical sector use cases. Membership in 5G Infrastructure Association is not required to participate in the activities. If you are interested in participating in this work, please send a mail to TrialsRoadmap(at)5g-ppp.eu highlighting briefly how you would like to contribute to the work of the group.